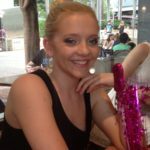 Wonderful Teen Birthday Party Idea – Mocktail Magic! Miss WW turned 17 on Sunday, in one year she will be able to enjoy a Cocktail party legally, but until then…. She wanted a birthday party where all her friends could get dressed up, put on the high heels, and get all glam, so a Mocktail Magic night was born, a full on Cocktail party, just alcohol free! I am quite sure that in another life I would have been a party planner. I just love sinking my teeth into a project and coming up with menu’s and accessories gives me great joy. So both of my girls have had a birthday party every year, because I just can’t help myself, I love doing it! No cocktail party would be complete without a bar, and my kitchen bench got a ‘little’ make-over, complete with barman. The good crystal was kept safely locked away, and an assortment of disposable glasses were swung into action and made for very easy clean up. Swizzle sticks and paper umbrella’s are a must. Two white washing baskets from Kmart filled with ice made really great ice buckets. CHAMPAGNE COCKTAIL – Dash of raspberry cordial, a sugar cube and non-alcoholic champagne. FRUIT COCKTAIL SLUSHIE – Partially freeze a 1 litre tetra pack of Golden Circle Sunshine Punch, pour the semi frozen juice into a large jug and fill the jug by pouring lemonade over the back of a large spoon (so you don’t loose the bubbles). ‘MIDORI’ – Fill an empty Midori bottle with lemon/lime soft drink. SHOTS – Lipton Ice Tea ‘Pina Colada’ and ‘Mojito’ flavours. ‘WINE’ – Recycled wine bottles were filled with water or cordial. No cocktail party would be complete without lot’s of morsels of bite size yumminess! Think small and bite size and you can’t go wrong. PIZZA BITES – I used two large round pizza bases and used a scone cutter to make little mini pizza’s. Half were made Hawaiian and the other half were Vegetarian with Semi-dried tomatoes, fetta cheese, onion and cheddar cheese. MEAT BALLS WITH CRANBERRY & PLUM SAUCE – Precook mini meat balls in advance and store in a freezer bag in the fridge until required. In a large pan add 1/2 bottle of plum sauce and 1/2 jar of cranberry sauce, over a low heat stir sauces until combined, then add the meat balls until heated through. Serve with little cocktail forks. MINI SPRINGS ROLLS – Store bought with sweet chilli sauce. DIP WITH VEGETABLE STICKS – Place a spoonful of dip into a shot glass and add the vegetable sticks straight up in the glasses. SALSA AND CORN CHIPS – Same as above, with salsa in the shot glass and then I used Mission Corn strips place straight up in the glasses. MINI SAUSAGE ROLLS – Store bought with tomato dipping sauce. MINI SPINACH, FETTA AND SUNDRIED MUFFINS – As we had a few vegetarians as guests these were a yummy addition to the menu. Much to my surprise, MissWW wanted a candy buffet again this year. 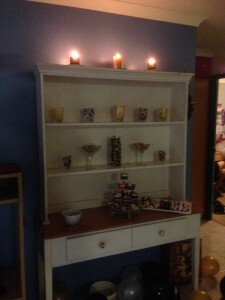 So we cleared the hutch and filled pretty glass wear with an assortment of sweets treats. Chocolate dipped marshmallows, snakes and banana’s were very popular. 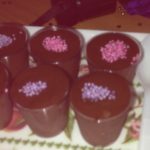 We also made jelly shots with gummi bears floating in them and chocolate mousse (will give you this fabulous recipe in a future post) shots went down a treat. Miss WW is one of those strange creatures that DOES NOT LIKE CHOCOLATE CAKE! So caramel mud cake was the cake of choice, and using two different recipies I created my own, together with the most fabulous caramel icing I have ever tasted. I was going to build an Opera House out of royal icing, but one Cyclone Oswald and torrents of rain and high humidity and everything was totally damp – decided that was not a good idea, so at the last minute created one out of pearlised white paper. Not quite the affect I wanted, but one has to compromise sometimes! 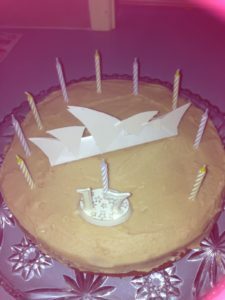 I promised my daughter she would have an Opera House on her birthday cake if she got through to Physie Nationals last year and she did….you can read all about that here. We used lot’s of candles for atmosphere. Black, white and gold balloons to give the large family room a party feel. Some fairy lights glowed outside……and thank god for tiled floors, an absolute breeze to clean when it was all over. After almost cancelling the party due to the unbelievable weather, I am so glad we didn’t, she had a wonderful night, spent with her friends. Sharing this for FYBF at With Some Grace, come and join the fun! A Celebration, A Cyclone, And A Clean-Up…What A Weekend! 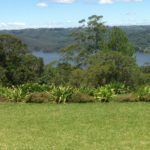 How To Celebrate A 60th Birthday In Style, Without Blowing The Budget! What great thought and preparation went into this party. It sounds like the sort of party that I would love – one with great food & drink! I hope your Ms17 truly appreciated it all! A mocktail party is such a great idea! 17 year olds are so much more sophisticated than I was when I was 17! I think we went to Sizzlers…the glamour! That said, I wonder if Miss 16 (who had absolutely NO interest in a party this year) will be keen on a Mocktail Party next year?